Announcement Fragrant Blends for Body, Beauty, and Balance. Fragrant Blends for Body, Beauty, and Balance. I especially like the texture of this balm. Thank you! These scents are gorgeous! I get compliments on them all the time and have had many friends order it. I wear "Gabrielle" but have worn all the different fragrances and love them. Nice! Smells good feels cool. Starts very cool at first but softens to the perfect coolness. Cute packaging! 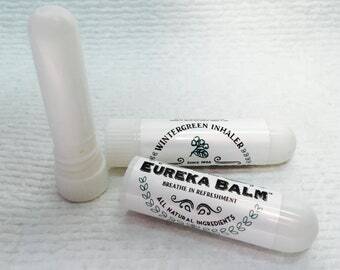 Eureka Balm Gift Sets-Give the gift of Winter Wellness. An Inhaler to clear sinuses, a tin of muscle rub for sore muscles, & a wintergreen lip balm for winter dry lips!